Turkey may get the spotlight on most Thanksgiving tables, but you can still serve up some vegetarian Thanksgiving recipes to give that produce a run for its money. From autumn salads to tasty vegan-optional dessert, discover eight vegetarian Thanksgiving recipes debuted by bloggers around the web. Filled with just as much color as there is flavor, this gorgeous vegan autumn kale salad from eat-drink-garden.com can be more than a side dish on your Thanksgiving table when you add a cup of brown rice or quinoa to this fall salad. For dressing, combine first 6 ingredients and whisk in oil. Set aside. Remove the ribs of the kale, then wash and chop into a dice. You should have about 4 cups packed. Thinly slice the watermelon radish and then quarter the slices. Thinly slice the shallot and place in a bowl of fresh water while you are prepping the rest of the ingredients for the salad. When you are ready to toss the salad, dump the water out and squeeze the excess water out of the shallots. This helps take out the raw taste from the onion. 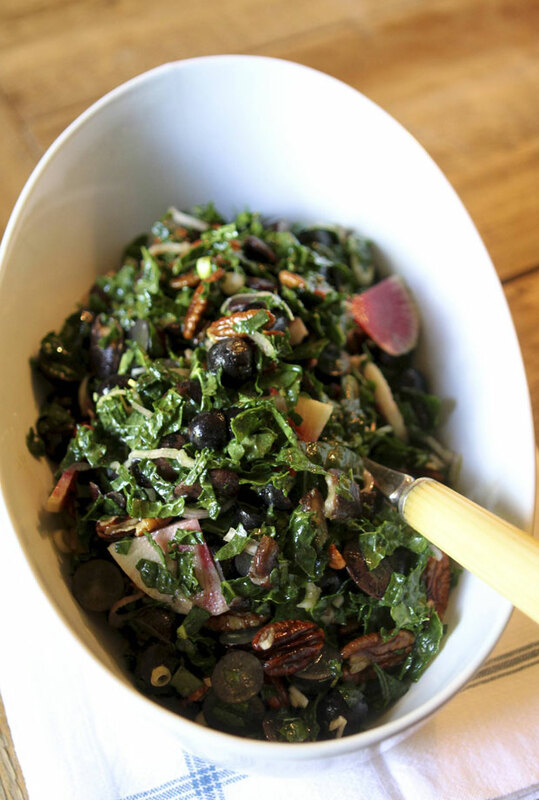 In a large bowl combine the kale, radishes, shallots, grapes, spiced nuts, beans and 1/2 cup of the dressing. Toss the salad. Let the salad sit for a minimum of 30 minutes before serving so that the kale soaks up the flavor of the dressing. When just about to serve, squeeze the juice of 1/2 of a lemon over the salad and toss one more time. 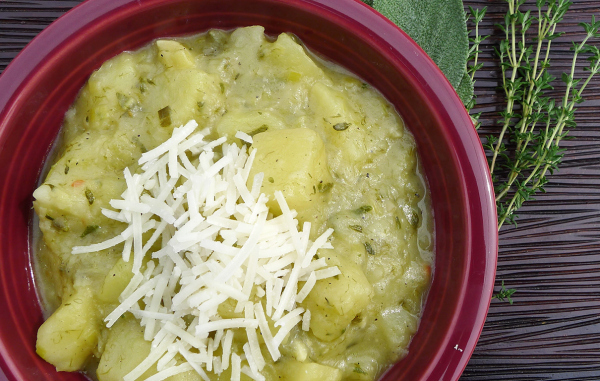 A cold weather staple, potato leek soup is a rich, nutritious and filling soup that's pretty hard not to love. This recipe from Sprout it — a free app to help you grow your own veggies and herbs at home — can also be modified a bit to accommodate a vegan diet and will be just as delicious. Melt butter over medium-low heat in a large pot. Add the dark green portions of the leeks and sauté until soft, about 5 minutes. Add the olive oil, the remaining leeks and garlic and sauté for an additional 5 minutes. Pour in vegetable broth and bring to a low boil. Then add the potatoes, sage, thyme and crushed red pepper and allow the mixture to simmer until the potatoes are tender. Reduce heat and, using a potato masher, smash the soup right in the pot until it's a desired consistency. We like ours a little on the chunky side, when less than half of the potatoes are mashed. Add milk, salt and pepper to taste and keep over low heat for another 5 minutes. Ladle into large bowls and top with shredded pecorino. 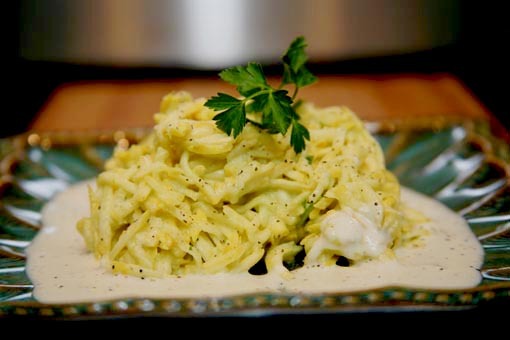 Give your juicer a whirl with this yellow squash spaghetti from LeBootCamp.com that is bursting with more flavor than the usual squash dish you'll find at Thanksgivings past. Sauce preparation: In a juicer, juice the celery root and the apple. Add the juice to a high-speed blender with the cashews and lemon juice. Blend until completely smooth, adding water if necessary to thin it to a creamy sauce consistency. Add the truffle olive oil, salt and pepper, to taste. Set aside. Spaghetti preparation: Place the grated squash into a colander with 1/2 teaspoon of sea salt and let sit for at least 30 minutes to allow some of the liquid to drain. Place the squash in a medium bowl. Add the peas and chives. Add a ladle or 2 of the sauce — enough to lightly coat the squash and season with some salt and pepper. Arrange some squash in a shallow serving bowl and spoon some sauce around it. Enjoy right away! Bring the outdoor bounties of Thanksgiving indoors with this freshly roasted autumn vegetables dish from wheredogorillasgettheirprotein! Because this blogger doesn't give measurements as vegetables vary in size, she advises to just keep chopping up vegetables until you have a big serving of this vegetarian recipe for each person. 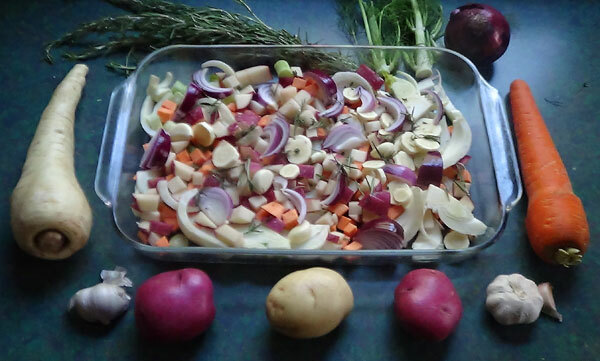 Cut up the vegetables into small chunks and place them in a baking dish. Mix the herbs into about half a cup of water or stock, with about a tablespoonful of balsamic vinegar. Pour over the vegetables. Put it in on the bottom rack of the oven and turn the oven on and set it to 350 degrees F.
A fall twist on a classic vegetarian recipe, you'll wow your guests with this gluten-free Thanksgiving staple from lorakrulak.com. Preheat oven to 400 degrees F. Grease a 2-quart baking dish OR 4 small ramekins with butter. Meanwhile, bring about 6 cups of salted water to a boil in a large saucepan. Add squash and bring back to a boil, lower the flame and simmer until tender, about 8 to 12 minutes. Mash the squash, and set aside. Bring a large pot of salted water to a boil and add the noodles. Cook for about 6 minutes — you want them undercooked — gluten-free noodles get mushy very fast. Drain the noodles and set aside, saving about 1/4 cup of the cooking water for the sauce. Whisk 1 cup of the milk, mustard, sage, salt and pepper in a small bowl until smooth, set aside. Heat 1 tablespoon of butter in a large saucepan over medium-high heat. Add 2 cups milk and bring to a simmer. Whisk the flour mixture into the simmering milk, whisking constantly. Continue to cook just until the mixture bubbles and thickens. Turn the heat down and then whisk the cheese into the thickened milk mixture until it is melted. Add the mashed squash and whisk until combined. 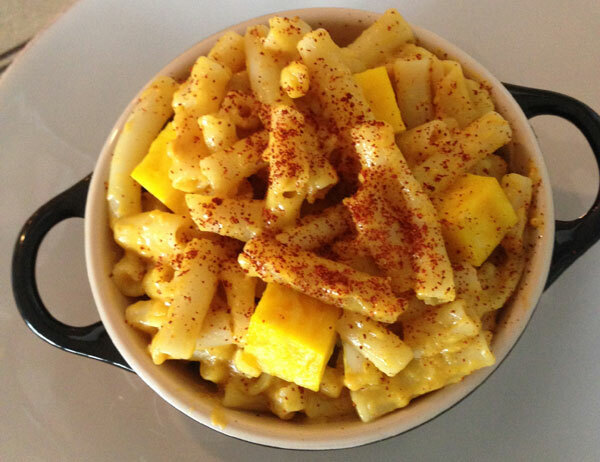 Stir in the macaroni and mustard mixture. Transfer to the baking dish or mini casserole dishes and top with paprika. Bake for about 10 to 15 minutes or until bubbling and brown on top. Baking in less than an hour and packed with heart-healthy ingredients such as bell pepper, garlic, onion, kidney beans, pumpkin and brown rice, this seasonal Thanksgiving vegetarian recipe for pumpkin chili from dietsinreview.com will keep you full for hours while tantalizing your senses with the savory smells of fall! 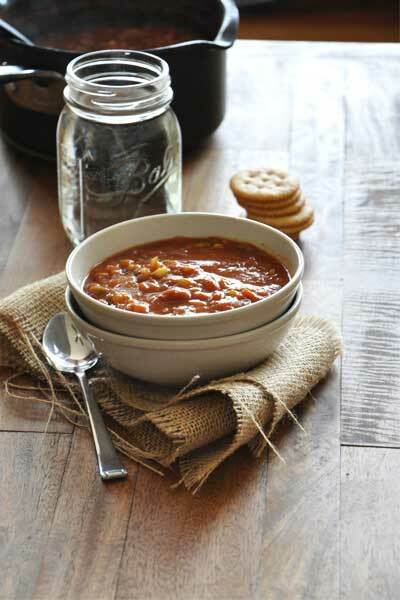 Heat vegetable oil in large soup pot or Dutch oven over medium-high heat. Sauté onion, garlic and bell pepper for 3 minutes. Add the rest of the ingredients, bring to a boil and then reduce to simmer. Cook for 30 minutes. ^ Love this recipe? Savor more fall flavors with these 11 pumpkin recipes to kick start your fall cooking from dietsinreview.com! 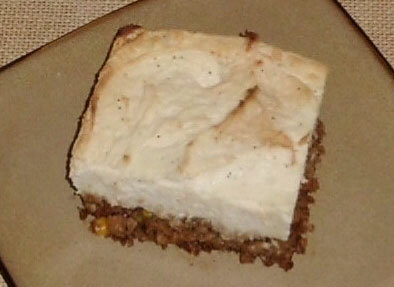 Using vegetarian ground "meat" and fluffy mashed potatoes, vegetarians can skip on the turkey and still get their protein with this warm and delicious vegetarian shepherd's pie recipe from prettyveggie.com. 3 pouches vegetarian ground "meat"
Sauté ground "meat" on medium in a bit of oil until it is slightly "caramelized." The trick to using veggie meats is to be sure the outside is browned well so the product stays together. While sautéing, add carrots and parsnips. Add peas a bit later, as they are already cooked. Add a bay leaf (remember to remove it later! ), and a bit of Worcestershire sauce. Use the herbs and spices you prefer, but shepherd's pie is not known as a very "herb-y" or spicy dish. It's pretty mellow. Also, check the ingredient label on the "meat." Some already have seasonings, some don't. Add salt if needed. Mix a bit of xanthan gum with vegetable broth, and add to mixture in pan to add "stickiness" to the meat. You can also use a flour or cornstarch mixture. (I happened to have xanthan gum.) Stir. Add peas. Spray a baking pan (round or square) and pour in meat mixture. (Did you remove the bay leaf?) Press down slightly, and add mashed potatoes on top. Leave some peaks. They brown nicely. I forgot last time and missed seeing them. Bake at 350 degrees F until heated through and browned on top. Remove from oven, and let rest before serving. As you can see in the photo, I didn't let it rest long enough and the potatoes "shifted." But, my stomach never knew the difference and it was delicious anyway! 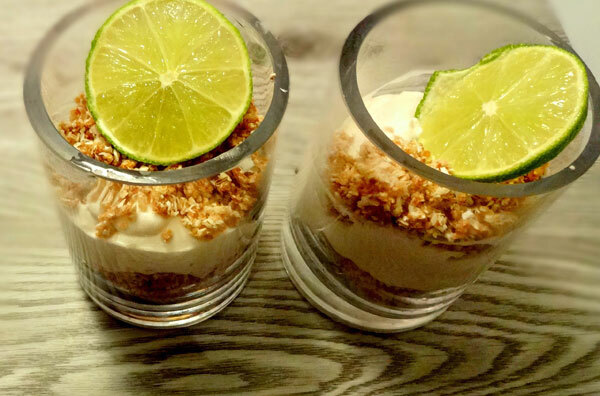 Not only are these Key lime cups from bakingbackwards.blogspot.ca a tasty twist on the traditional Thanksgiving pie, but this recipe is also gluten-free, naturally sweetened, mostly raw, paleo, vegan optional, nut-free and soy-free! Chill a small mixing bowl for 5 minutes in freezer. Do not shake and do not flip your can of chilled coconut milk. Open the can and remove only the thick white cream that will have solidified at the top of your chilled can, try to avoid scooping out any of the watery liquid at the bottom. Add skimmed coconut cream, salt, maple, cinnamon and olive oil. Beat together in your chilled bowl with an electric mixer for 1 minute. Add lime juice and beat for 1 to 2 minutes. Add the honey and the melted creamed coconut and beat until the mixture appears thickened. Scrape down the sides of the bowl and beat for 10 more seconds. Chill the bowl in the freezer while you make the crumble topping. Pulse then blend all ingredients to a crumble consistency in your food processor. Spoon half the mixture into the bottom of 2 glasses or jam jars. Spoon the chilled lime filling into the cups evenly. Top with remaining crumble mixture evenly and garnish with a slice of fresh lime. Chill the cups in the freezer for 10 minutes or more, serve.